Orwell Prize-nominated journalist Heidi Blake uncovers exclusive details of Vladimir Putin's worldwide meddling with dissident voices. This is the explosive and true story of how Russia operates in our cities, right under the noses of the most powerful nations in the world, and why even they can't stop him. Russia's resurgent encroachment into the West is the defining geopolitical story of our time - and a topic of insatiable public fascination. 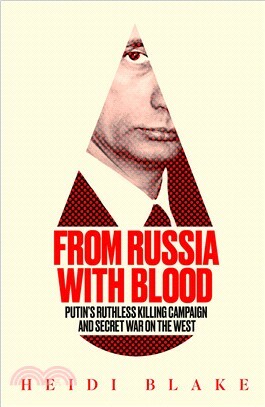 Putin's use of targeted killing is designed to crush opponents, frighten critics into silence, exterminate traitors, and wipe out the Western financial facilitators who make flight from Russia possible. In one sense this is nothing new: the Russian president is the consummate FSB man and an heir to Soviet-era autocrats who used the country's feared security service to eliminate all opposition. But the growing pattern of brazen assassinations outside Russia's borders is a mark of an emboldened state with burgeoning global ambitions. Set in the heart of our cities, From Russia With Blood will analyze the geopolitical consequences of this strategy, and the dangers of the West's flat-footed response. Drawing on the expertise of Russian experts, intelligence insiders, academics and government sources in the US and Europe, Heidi Blake will uncover what has been kept from the public up until now. This book is based on hundreds of thousands of documents, crime scene evidence, computers and mobile phones, surveillance footage, high-level intelligence briefings from serving officials, and hundreds of insider interviews - but this is only the tip of the iceberg. Supported by a vibrant cast of characters and a fast-paced narrative, this story will draw on original reporting to tell the full story of how Russia refined the art and science of assassination as a form of statecraft. But it will also offer insights into its formidable cyber powers, sprawling international propaganda machine and fearsome security, espionage and organised crime complex to create a frighteningly effective strategy for growing global dominance. This is an unmissable guide to how Western governments failed to guard those living on home soil against the threat, the dramatic events of the past year and their alarming significance for the future.